Plastic eyeglass frames are awesome. They are trendy, light weight, and very comfortable. What's not so awesome though, is the white discoloration and cloudiness that occurs after months or years of wear. At first I thought this discoloration was a build up caused by a combination of makeup, face cream, and the environment. I tried my best to clean it off with mild dish soap and gentle scrubbing, but it wouldn't budge. Upon closer inspection, I realized that the problem was much deeper. The plastic/acetate material itself had become cloudy, so in order to get rid of the discoloration, it would be necessary to remove the discolored layer of the plastic all together. I'm guessing that this discoloration happens because of a chemical reaction between the products we use on our face and hair and the plastic. It may also be caused by oxidation or a combination of the two reasons. 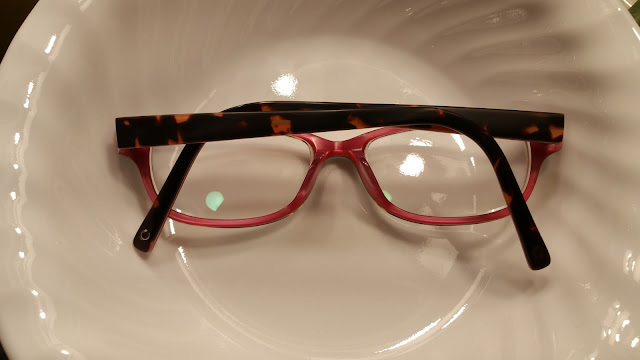 Here is what I did to fix my frames so that you can fix yours too. Be sure that you are very careful because plastic frames are a bit flimsy and require a gentle hand*. 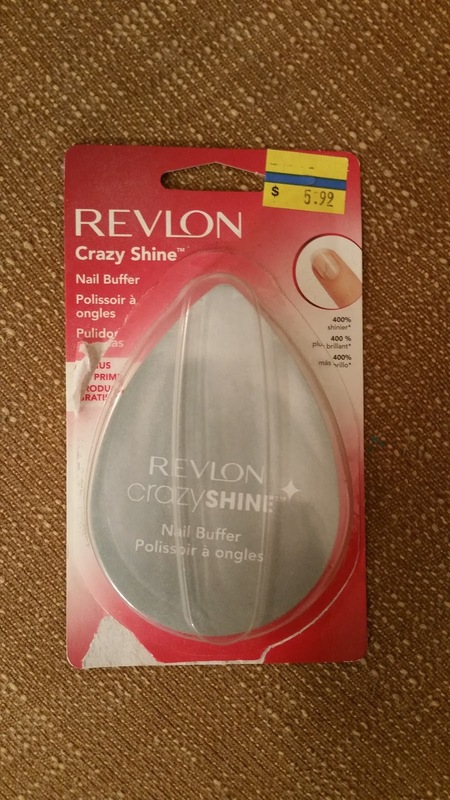 - A Revlon Crazy Shine Nail Buffer. These can be found in most drug stores. They are shaped like a large tear drop. I just used an old one that I have had for many years. I would NOT recommend substituting with any other type of sand paper or nail buffer as they may scratch your frames. The Revlon nail buffer is very gentle. If you can't find this nail buffer locally, you can purchase one on Amazon by clicking HERE (Amazon Affiliate Link). 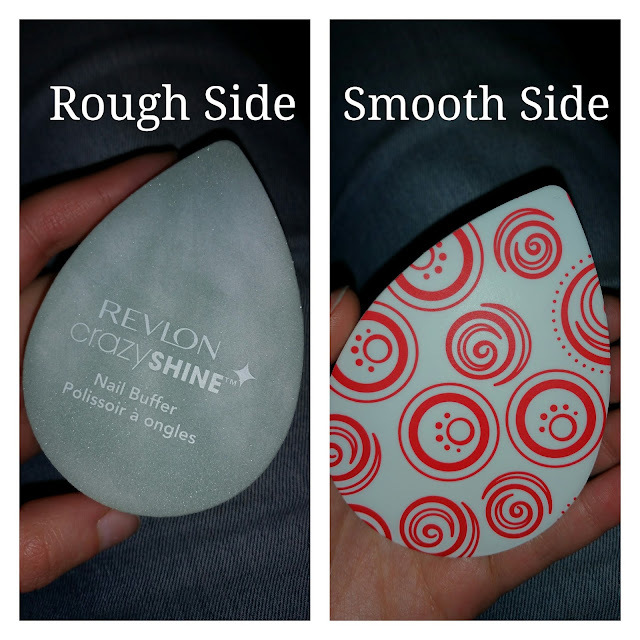 Looking at the nail buffer, you will notice that it has 2 sides, a rougher side and a very smooth side. To begin, we will start with the rougher side. 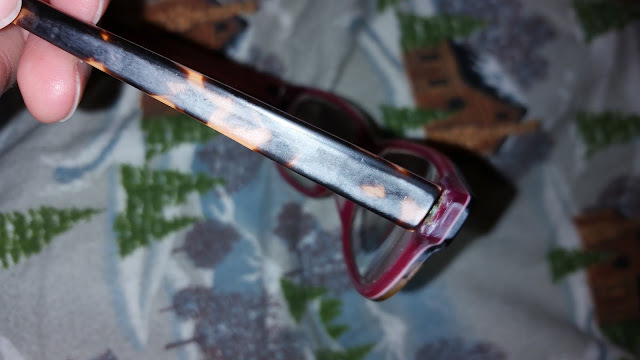 Locate the discoloration on your glasses frames, for me it was on the arms and they were so discolored that they were embarrassing and you could no longer tell that they were tortoise shell frames. Using the rougher side of the buffer, gently file away the discoloration. Support the arm of the glasses with the other hand and be very gentle as plastic glasses arms can be a bit flimsy. Use gentle strokes along the arm. The grit level on the Revlon Crazy Shine nail buffer is quite mild, so it is unlikely to mar your frames, but still be gentle. Also be very careful that you do not touch the lenses with the buffer. If your discoloration is near the lenses, I would strongly recommend either taping over the lenses or removing them before proceeding, in order to protect them. 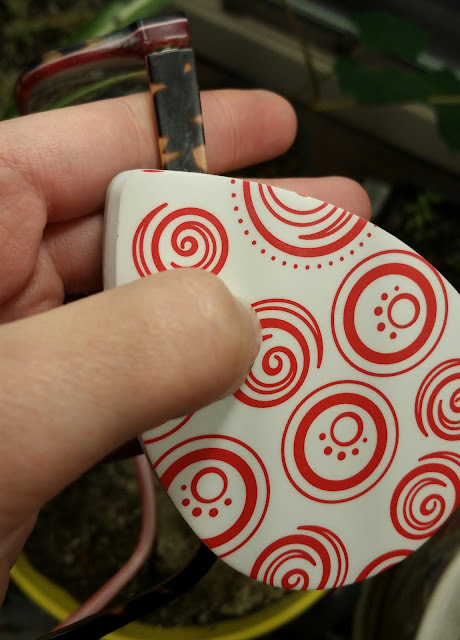 It's impossible to photograph a 2 handed project by yourself! Use both hands. One to support the arm of your glasses and the other to buff. Once you have been buffing for a while, you will notice that the discoloration has totally disappeared. Well, it hasn't really disappeared, you filed it off. 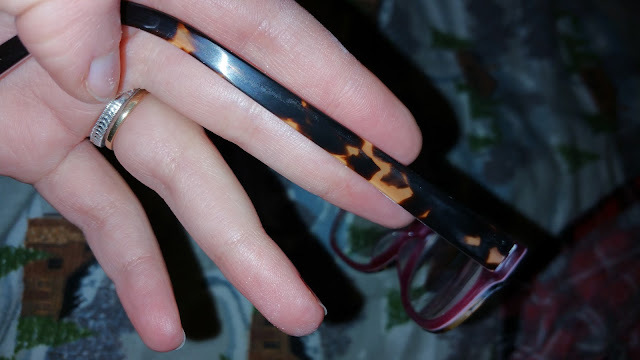 I can see the tortoise shell print again! 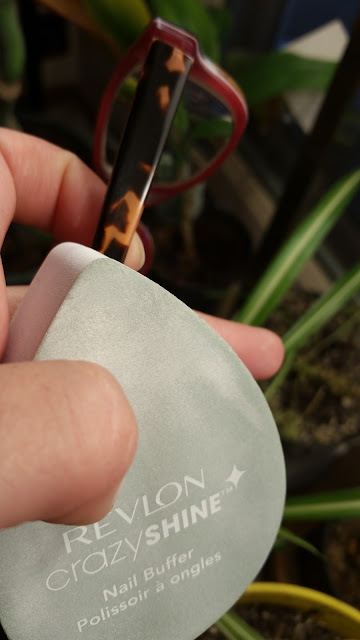 Now that you have removed all of the discoloration, you may notice that your frames may look a little lack luster, but never fear because that is what the smooth side of the Revlon Crazy Shine Nail Buffer is for. Using long and gentle strokes, buff along the length of the arm until it looks smooth and slightly shiny. Make sure to support the arm of your glasses and don't press hard. Some more awkward one handed photography. Use both hands when you do this. One to support the arm, and the other to buff. Once you are satisfied with how the arm of your glasses looks, inspect the entire frame carefully to see if there are any other areas that need some work. For me, it was just the arms of my glasses. 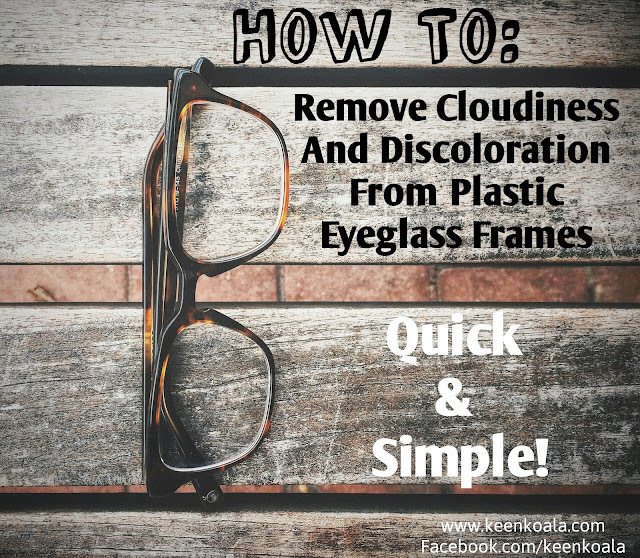 Once I finished using this method, my glasses looked as good as new. I feel proud to wear them again! Seriously, before doing this, I thought I was going to have to buy new glasses, but not anymore! They look just as good as the first day I got them now, and that is really saying something considering my glasses are 5 years old! Don't they look beautiful? Clean, shiny, and as good as new! I hope this tutorial helped you! Did you try it yet? Leave me a comment below and let me know how it went, I would love to hear from you. For more great tutorials, don't forget to LIKE Keen Koala on Facebook for instant access to the latest posts, exclusive content and contests by clicking HERE! *Disclaimer: Use this method at your own risk. Your results may vary. I will not be held responsible or liable for any damage that occurs to your eyeglasses from following this tutorial. Thank you.